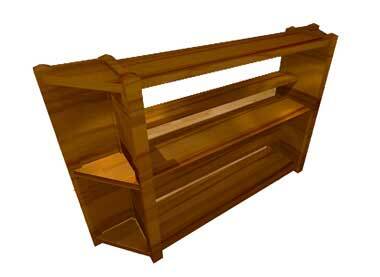 Build a mission-style plate rack for your dining room. Click here for detailed plate rack plans. 4 posts, 1-1/2 by 1-1/2 by 28 in., S-4-S.
1 top, 7/8 by 7-1/4 by 48 in., S-2-S.
2 plate rails, 7/8 by 6-1/4 by 32 in., S-2-S.
2 back boards, 7/8 by 7-1/4 by 25 in., S-2-S.
2 side boards, 7/8 by 5-1/4 by 25 in., S-2-S.
4 shelves, 7/8 by 6-1/2 by 8-1/4 in., S-2-S.
2 plate rests, 7/8 by 7/8 by 32 in., S-4-S. This stock is specified to exact thickness, but some allowance is made for trimming on the edges and ends. Begin work by squaring up the posts to length and beveling the top ends, then trim the back and side boards. These are nailed together, lapping the back board over the side board. The posts are fastened with dowels placed at equal distances apart. Hot glue is used in the joints. The four shelves are now put in place. These are notched out to fit around the posts and are nailed and glued. While the glue is hardening on these, the plate rails can be cut. These have 7/8-in grooves near the front edge to receive the lower edge of the plates when resting against the two strips placed 5 in. above the plate rails and far enough back to prevent the plates from falling forward. The rails are fastened to the two sides with dowels, three at each end being sufficient. The two strips fit in mortises cut in the side pieces. The top is then put on. This fits around the posts and rests on the sides. Hooks on which to hang cups are placed under the rails. All parts are thoroughly sandpapered before the stain is applied.